A beautifully animated, brilliantly scored, exquisitely judged platformer, equally modern and classic. 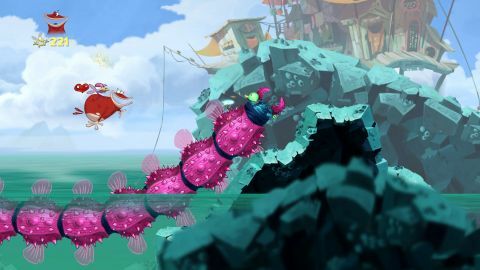 Having played Rayman Origins on the consoles, I'd already fallen in love with its colourful world. So coming to the PC version felt a bit like re-enacting a first date: a stupid but good-natured romantic fiction. But just as we're getting ready to go to that pub where we met, so I can pretend to come over and offer the PC version of Rayman Origins a drink, it turns to me, and lets its dressing gown fall to the floor. I am aghast. There's just a smooth patch of skin where the DRM should be. It's never looked more beautiful. Apart from that, this is a pixelperfect port of an inspired and downright wonderful platformer. Rayman distinguishes itself and embarrasses the competition with its visual design. The creativity that flushes through every square inch of the canvas makes Mario feel like a stage adaptation of a washing machine manual. Moreover, Rayman Origins exists comfortably in its two dimensions, the only concession to the third being understated parallax. It makes the hysterical original Sonic levels in Sonic Generations feel insecure and incoherent. Everything about the level structure makes Rayman Origins intuitive and joyful, and every design decision has been made to test the expert without alienating the beginner. The levels vary from familiar takes on platforming staples – cloud levels and underwater levels – to such oddities as a world based on didgeridoos. Gourmand Land takes food as its theme, effortlessly spinning snowy freezer cabinets and lava levels inside an oven. All levels are united by a deceptively simple aim: collect the small number of Electoons. Some will be in hidden areas, others won by collecting the hundreds of yellow Lums. Many of these are within easy reach, others fly out of bubbling platforms, acting as both rewards and signposts. King Lums add a touch of urgency and demand precision, doubling the value of other Lums you collect for a short time. Skull Coins are worth 25 Lums, and require the nimblest fingers and sharpest eye. To master a level, you don't have to collect every Lum, but it's so tight, you'll consider starting again if you miss one. That's where Rayman Origins pulls its friendliest and most compulsive stroke. Each level is split into short checkpointed stages, allowing you to explore, forage and suicide-restart your way across a level. Death isn't punished, and apart from a rude turning circle when negotiating tight underwater levels, no failure feels unfair. You'll never have to return to a level later, with your new powers: everything is within grasp on the first playthrough. The challenges vary. The bridgecrossing levels are low on hazards, but heavy on the speed-testing King Lums. The Mosquito levels transform the action into sidescrolling shoot-'em-ups, which are much more enjoyable when played on a gamepad. The optional Tricky Treasure levels are the toughest, and the only time when the game demands absolute perfection and declines to offer checkpoints. Apart from these levels, any frustration is bite-sized, manageable and deliciously compulsive. There's never a moment when you want to stop playing. With four players playing locally, it becomes enjoyably chaotic, even if the lack of online options is a bit of a lost opportunity. Aside from a disconcertingly phallic end-of-level sequence that's as unskippable as it is frequent and overlong, everything about Rayman's arrival on PC is slick and joyful. Origins is a rare and hefty slab of uncompromised pleasure.